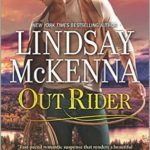 I’ve reviewed and/or spotlighted a few of Lindsay McKenna‘s books now, and I find that even though I’m not a heavy reader of romance novels, I always enjoy visiting with her characters, because the women are always strong and independent, and the men are usually sensitive and incredibly respectful of women, and both of those things need to be modeled more in our media. While I’m NOT a fan of anything that smacks of Western, I have five dogs, and I grew up with a love of horses, and was fortunate enough to spend a couple of summers at riding camp in New Jersey, or visiting friends in Nebraska and Colorado who had horses. 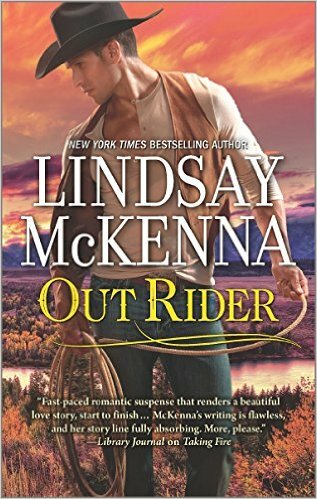 It was the horse-and-dog connection, as much as McKenna’s name, that really drew me to this novel. 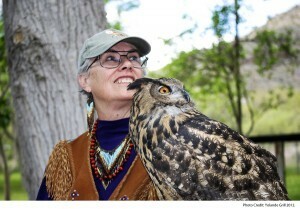 I mean, the story was so engaging she made me want to visit Wyoming. What I love about McKenna’s characters is that they’re usually seasoned adults. In the case of Out Rider, Dev and Sloane have each had their requisite tragic (for whatever reason) love affair/marriage. They’ve lived in the world, and experienced life’s fears and joys. That tempering, the fact that they’re not twenty-two-year-olds, is what I really love about this novel, in particular, and this author’s work in general. Yes, this couple is slightly idealized – it’s a romance novel, after all – but they’re still believable, dimensional characters. I also appreciate the way McKenna, who is ex-Navy, works military backstories into her work. Many of her characters, both men and women, are either active-duty or ex-military, and not just as a line-item in a description. They rely on skills taught while they were in the service, and demonstrate a love of country that feels sincere without being preachy. It takes a really smart writer to pull that off. As I mentioned before, part of what drew me to this novel was the animals. Dogs and horses are a classic combination, in life, and in fiction, and stories built around them always appeal. McKenna ties the love of these animals into the story making them almost-characters, but never, ever, allowing them to stray into cuteseyness. If you want to read a formula romance, this is NOT the novel for you. 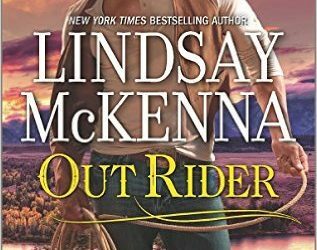 If, however, you want to read a really good love story about people who could be real (and maybe fall a little bit in love with Wyoming), I highly recommend Out Rider. Goes well with chili rellenos, black beans and rice, and a cold beer. Want to read Out Rider for yourself. One lucky winner will get a DIGITAL COPY (e-book) of this novel. How do you enter? Find my post about this review on Twitter (@Melysse) and retweet it, or find my post on Facebook and like/share it. One of my dogs and I will pick the winner from all entries received by 11:59 PM US CDT, on Sunday, May 29th. Please note: aside from selecting the winner, I have NO CONTROL over this giveaway. I will supply the winner’s email address to the publicist, and they will be responsible for sending the book (in this case, an ebook).